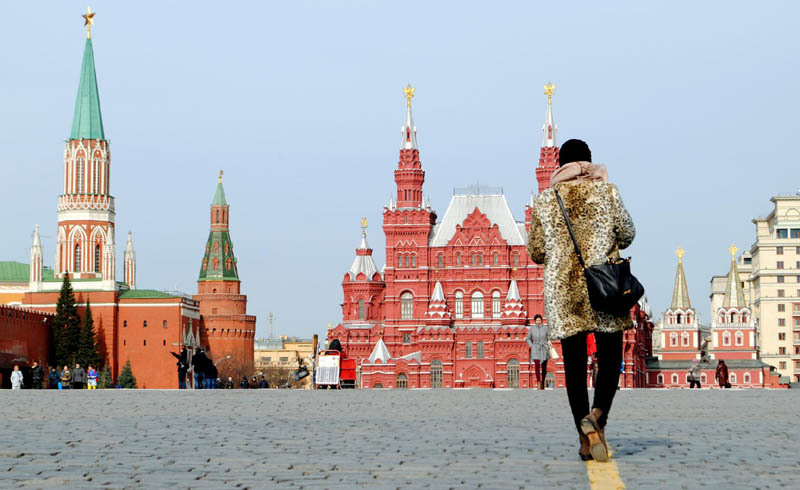 In most cases, you'll be entering Red Square from the north, passing landmarks such as the Bolshoi Theatre and Duma parliament building as you make your way southward. Although you don't necessarily have to pass through the Voskresensky (or Resurrection in English) Gates in order to gain access to the square these days, they definitely provide a sense of arrival, to say nothing of the way their left arch frame's St. Basil's Cathedral if you look from just the right angle. An interesting fact is that while a gate of some kind has stood here since the mid-16th century, the one you currently see wasn't built until 1994, having been destroyed in 1931 so that tanks could enter and exit Red Square during military parades. 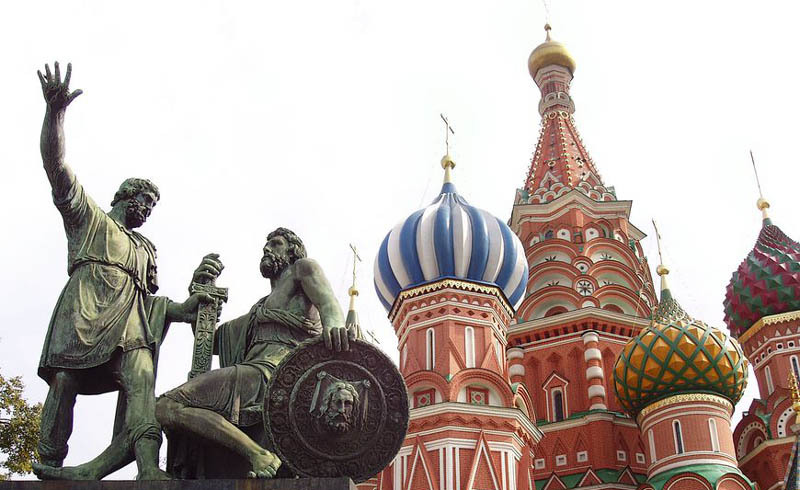 Few sights are as iconic not only of Moscow and Red Square, but indeed of Russia than St. 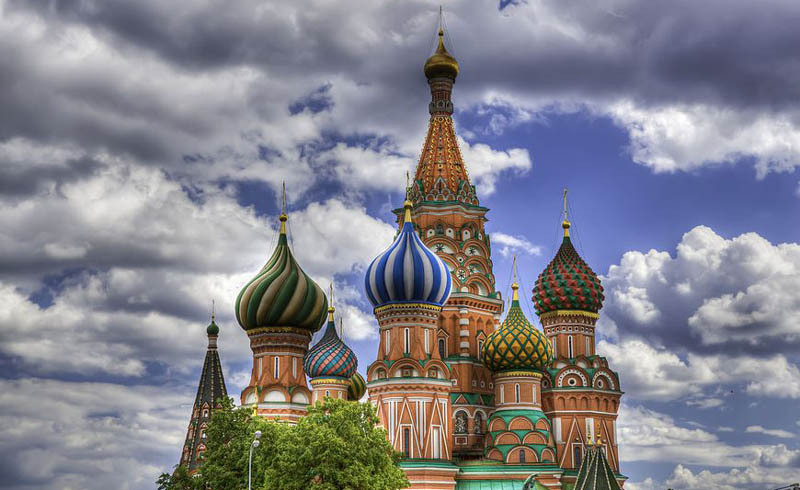 Basil's Cathedral, whose colorful, onion-shaped domes are a symbol of the country around the world. Officially known as the Cathedral of Vasily the Blessed, this church has stood since 1561, which is quite miraculous when you consider all the turbulent history that has transpired since then. 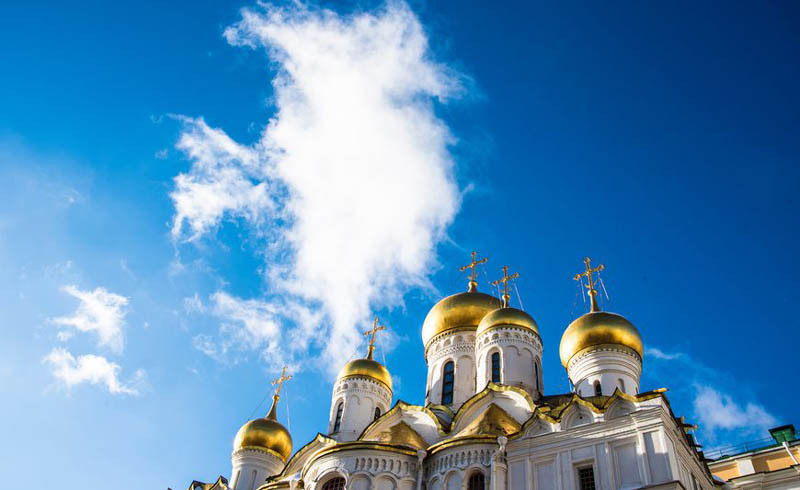 Among other things, religion was severely prohibited during the Soviet period, which led some to believe that this emblem of the Russian Orthodox church might not withstand the tenure of the USSR. An interesting fact is that St. 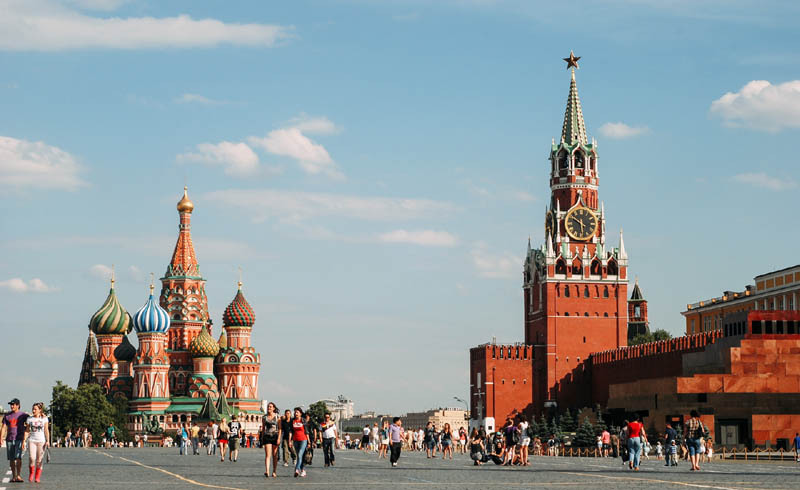 Basil's is the so-called "Kilometer Zero" of Russia; all of Moscow's main roads (which can take you anywhere in Russia) begin at the exits to Red Square. In this way, St. Basil's iconic status also has an extremely tangible element. When you think of The Kremlin, it's unlikely that positive images enter your mind. 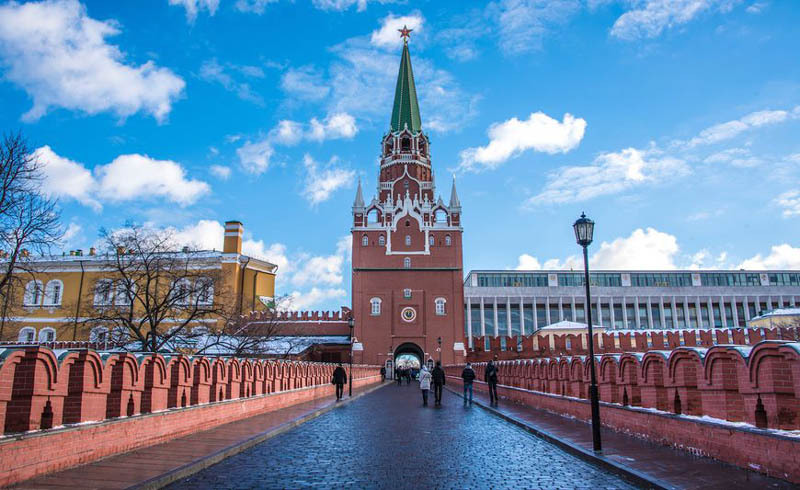 The fact that simply saying the word "Kremlin" is too vague a descriptor (most Russian cities have their own Kremlin complexes; you should say "Moscow Kremlin") notwithstanding, this misunderstood place is incredibly beautiful, even if you don't like the policy that comes out of it. In spite of its name, which refers to the role the building that rises above the square played during Imperial Russia, Senate Square is actually home to Russia's presidential administration, currently helmed by Vladimir Putin. In order to see where Russia's legislature operates from, walk just outside Red Square to the Duma parliament building. Dating back to the year 1479, the gold-domed Dormition Cathedral pays homage to an Orthodox religious feast that commemorates the death of the Virgin Mary. As is the case with St. 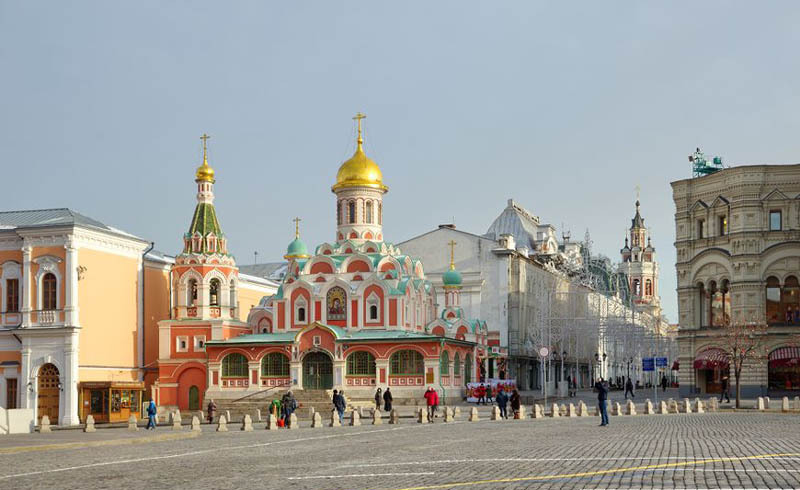 Basil's, it is curious that such a conspicuously religious structure was able to survive through the Soviet period. Though it takes its name from the fact that it housed Russia's royal arsenal when it was built in the 16th century, the most notable resident of the Kremlin's Armoury Chamber today is the Russian Diamond Fund. The interior of the Moscow Kremlin is more beautiful and inviting than you'd expect, but the walls and towers that rise around it better live up to the intimidation with which the complex is associated. Named to commemorate the dense forest that once stood atop the mount where it's built, this tower is extremely picturesque. 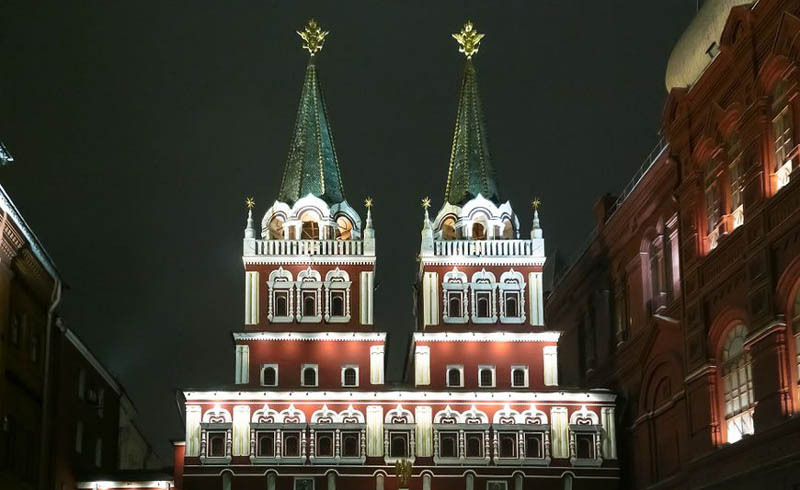 Built in the late 15th century, it's visible from most places in the square, and also as you walk along the Moskva River. Also built in the year 1491, this tower currently suffered destruction at the hands of Napoleon's army in the 19th century. What you see now is the result of an 1816 re-design and renovation, though artillery fire during the Russian Revolution also caused superficial damage to the tower, named to honor St. Nikolas of Mozhaysk, so it's difficult to know which elements of it are original. Known in English as the "Savior's Tower," this iconic, star-topped tower is perhaps the best-known of all the Kremlin's towers. Built in 1491 like the other two towers on this list, it's certainly the most photographed. As a result of its proximity to St. Basil's, it often makes its way into tourists' pictures. 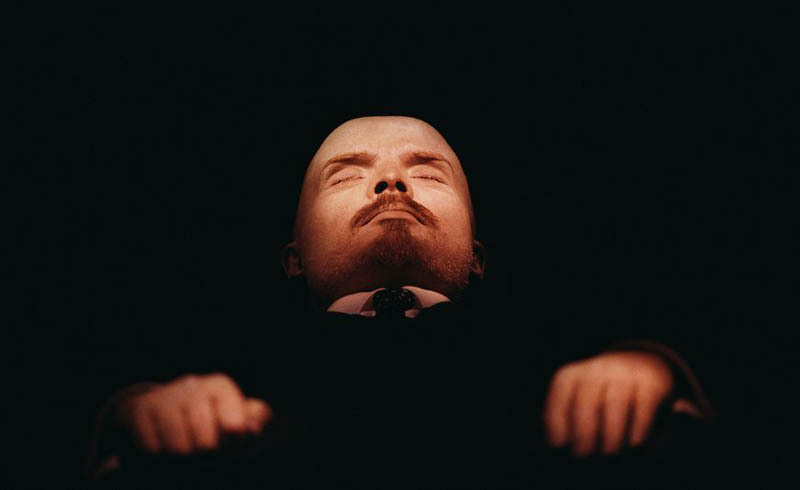 Just as it's strange to learn how many religious monuments survived through the Soviet period, it's a bit odd to think that Lenin's preserved body still sits in a mausoleum just beneath the walls of the Kremlin on Red Square, given the lack of consensus about the ultimate impact of his Revolution, even in Russia. It's not guaranteed that you'll be able to see the body (which, believe it or not, seems to be improving with age) when you go, and if you do you will likely have to wait in line, but even strolling past the outside of the Lenin Mausoleum, flanked by stone-faced guards that almost look like statues, illuminates the gravity of his body still being here. 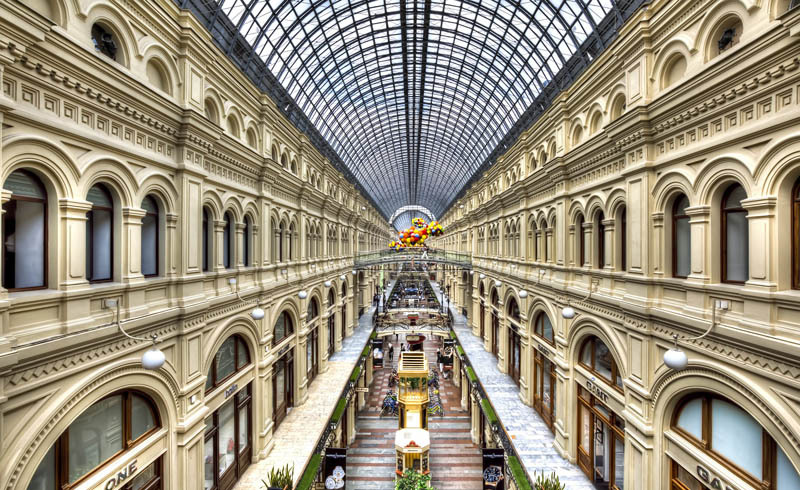 You might cringe, at least initially, when you realize that one of the most iconic stops on a tour of Red Square is a department store—until you see said department store, that is. Built in 1893 and known during Soviet times as the State Department Store, GUM (Glávnyj Universáľnyj Magazín​ or Main Universal Store in English) hearkens back to the grandeur of the late 19th century, both seen from the outside (especially, when lit up at night) and the interior, which might have you feeling like you're further west in Europe. A trip inside GUM is a particularly good idea during winter, when frigid temperatures outside will have you savoring the heat, the quality of souvenirs, confections and other goods sold inside notwithstanding. Also, make sure not to confuse GUM with CDM, which sits near the Bolshoi Theatre, even though both are stunning and iconic in their own right. 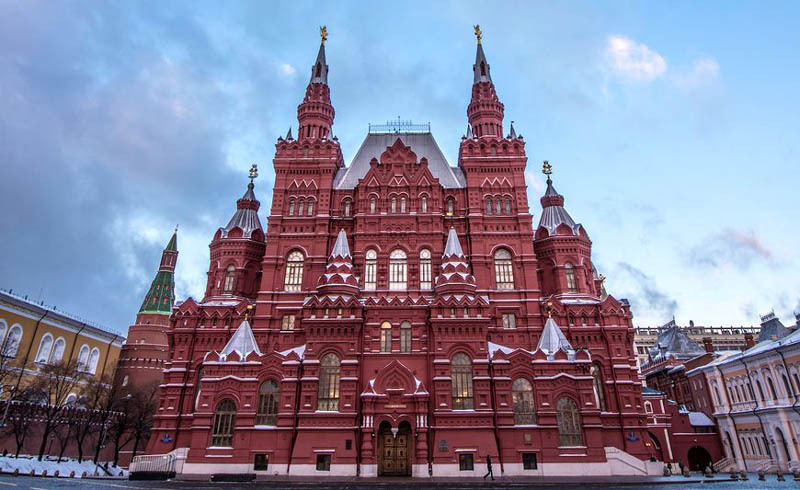 The Russian State Historical Museum is located near Voskresensky Gates, though you should wait until after you'll seen the first few attractions of Red Square and the Kremlin to head back there and go inside. To be sure, as you pass by its facade (whose late-19th century grandeur somewhat obscures that fact that it's currently a museum accessible to the public) you might not even think to try and gain entry. Once inside the museum, you can plan to spend at least a couple of hours, given that artifacts here date back to the very beginning of the Russian state in the ninth century. 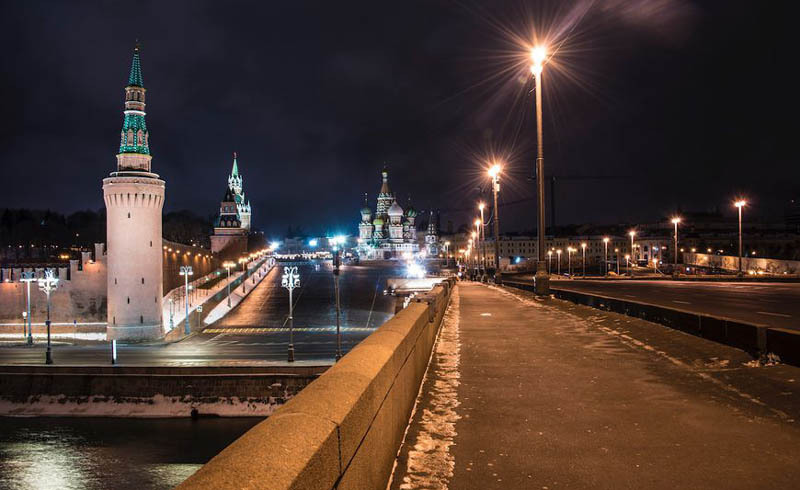 As is the case with GUM, this will be a particularly alluring prospect if you visit in winter, when Moscow is arguably at its most beautiful, but certainly at its least tolerable. It's somewhat easy to disregard this monument, which pays homage to the two Russian princes who ended the so-called "Time of Troubles" in the mid-16th century, during which Polish-Lithuanian forces occupied Russia, among other awful things including a famine. That's because the statue currently sits just at the base of St. Basil's Cathedral, which makes it very difficult to photograph or even see without being overwhelmed by that much more famous edifice. Though the statue originally sat at the very center of Red Square, it came to be an obstacle to the movement of tanks during the Soviet period, much like the Voskresensky Gates. As a result, authorities moved it during that time, and it's stayed where you currently find it ever since. Taken by itself, the smokey-pink Kazan Cathedral is an architectural marvel; originally built in the 17th century, the church you find here today, located just north of the GUM department store, dates back only to 1993. Unfortunately, since it sits not only in the shadow of GUM, but also in the shadow St. Basil's and the Towers of the Kremlin, it's easy to miss entirely if you aren't looking. As a result, you might wait until you've seen just about everything else in Red Square before coming here to take photos, and to appreciate the understated beauty of this oft-overlooked cathedral. As you head south from St. Basil's Cathedral to exit Red Square, make sure to walk onto Bolshoy Moskvoretskiy Bridge, which crosses the Moskva River. If you look due north, you can get an excellent shot of the church framed, on the left, by the towers of the Kremlin. Directing your gaze a bit to the west allows you to see the skyscrapers of Moscow City as they rise above the Kremlin's walls.